Troutrageous! Fly Fishing & Tenkara Blog: Tenkara Tuesday - A New Controversy? Tenkara Tuesday - A New Controversy? As many of you may already be aware, I was lucky enough to meet a lot of tenkara-minded folks at the Fly Fishing Show last weekend. It was a tenkara summit of sorts, albeit in Somerset rather than Salt Lake City...or at least a tenkara blogger summit, which in my opinion is just as good. Sorry Daniel, your secret is out, wookies prefer tenkara too. tenkontroversy Now thats a funny word. Now I'm really upset that I went Sat. and not Sun. The chance to meet Daniel AND Chewbacca together! Yeah, you really missed out. Maybe next time. 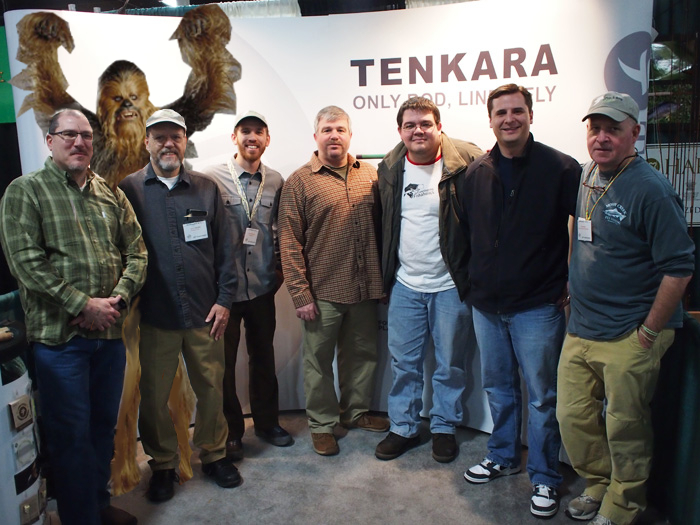 Rumor has it Daniel cropped out Chewie because our Star Wars themed tenkara gear was not quite ready yet for the fly fishing shows. Rumor has it two new rods will be made. The Chewie-Ito will be a dual length rod with lengths of 20' and 25' fully extended. Perfect for fast moving galaxy rivers and large folk like Chewy. Then the new Ewokiwana will be a 6' rod perfect for, well you know, the ewok size waters. I also heard mention of the new rod being made for 2025 that will have a light saber handle but too early to tell from prototypes it will be best used for catch and release fishing. Appears too many arms have been lopped off while sticking the rod under arm while de-hooking a fish. Pretty accurate description. There was also a prototype JarJarEbisu at the show, but nobody liked it. He's saving for an Ito. All I can say about the wookie, is clip and tie, clip and tie. Spun wookie hair is deadly on the ice floes of Hoth. This is the second time I've heard of tenkara rods (I know, come out of the cave), but they look really cool. Are big outfitters selling these yet? Some fly shops are, but mostly they are direct from manufacturer (i.e. Tenkara USA). The big boys have not bellied up to the tenkara bar yet. Check out the tenkara tab on this blog and you find a whole list of where to buy. Anything endorsed by Chewbacca has to be awesome. How do Star Wars and fly fishing mix again? Fish or fish not...there is no try.